With Spring Training underway and the 2018 season almost upon us, MiLB.com is ranking all 30 farm systems based on certain changing criterion with each edition. After looking at position player prospects (30-21, 20-11, 10-1) and pitchers (30-21, 20-11, 10-1), this edition focuses on prospects who will be 21 years old and younger on Opening Day and considers the quality and quantity of top talent in each system in its current state. Here are the complete rankings of all 30 organizations with player ages in parentheses. Analysis: This ranking is not to say that the Cardinals have a bad system, as our recent Pitching and Position Player lists illustrate. However, much of St. Louis' best talent is older and higher in the organization. Some intriguing youngsters do dot the system, however, led by 21-year-old Jordan Hicks, a third-round pick in 2015 who brought his sizzling fastball to Class A Advanced Palm Beach last season and was dominant over eight appearances. Analysis: The D-backs system is improving, but mostly due to former college players such as Jon Duplantier and Pavin Smith. Shortstop Jasrado Chisholm (20) and outfielder Marcus Wilson (21) both showed strong hit tools for Class A Kane County in 2017 and represent the best of the this bunch. Analysis: Nine months ago, the Mariners probably would've finished dead last in this ranking. However, adding 21-year-old first baseman Evan White and teenage right-hander Sam Carlson (19) in the first two rounds of the Draft -- as well as signing toolsy 17-year-old outfielder Julio Rodriguez on the international market -- gives them enough interesting pieces to leapfrog the prior two teams. Both White and Carlson will have a chance to show more in their second seasons after being limited to 14 games and two starts, respectively, in their pro debuts. Analysis: With the North Siders clearly in win-now mode, the days of the Cubs ruling prospect rankings has seemingly come to an end. Chicago still boasts a few young pieces in their system, led by shortstop Aramis Ademan (19) and righty Jose Albertos (19), both of whom appeared with Class A Short Season Eugene in 2017. The pair has solid tools and ceilings, but not as high as players who have come through the system in the recent past. Analysis: Like the Cubs, the Mets' system has seen better days as many of their top young players have gotten older or graduated to the Majors. Talented shortstop Andres Gimenez (19) is now the organization's top prospect, and he's coming off a decent season in which he batted .265 with 14 steals at Class A Columbia. Lefty Thomas Szapucki (21) had an outstanding 2016 but missed all but six starts last season after undergoing Tommy John surgery in July. Analysis: Each of the Royals' top four prospects -- Khalil Lee, Nick Pratto, Seuly Matias and MJ Melendez -- will be 19 years old on Opening Day. Lee put together the best statistical season of the foursome, smacking 17 homers and 24 doubles while stealing 20 bases with Class A Lexington, though there are questions about his hit tool after he batted .237 and fanned 171 times in 121 games. Catcher Meibrys Viloria, who won the Pioneer League batting title in 2016, has shown the most potential so far beyond that top quartet. Analysis: The Marlins are on the rise in this category, with potential to climb even higher. They added three solid 21-year-old pieces in the offseason: Magneuris Sierra from the Cardinals, Isan Diaz from the Brewers and Nick Neidert from the Mariners. The club's most recent first-round picks, lefties Braxton Garrett (20) and Trevor Rogers (20), have a total of four Minor League starts between them, but if that duo can stay healthy and take steps forward this season, Miami could jump multiple spots next season. Analysis: The Orioles are the first team with a top-100 prospect in their cohort: No. 98 overall Ryan Mountcastle. The 2015 first-round pick slugged 18 long balls between Class A Advanced Frederick and Double-A Bowie last season. Hurlers DL Hall (19) and Brenan Hanifee (19) have been added the past two Drafts, the latter posting a 2.75 ERA that was top 10 in the Class A Short Season New York-Penn League. Further down the rankings is lefty Alex Wells (21), who was the South Atlantic League's top pitcher with a 2.38 ERA and just 10 walks in 140 innings at Class A Delmarva. Analysis: The Giants are this high on the list for one big reason: 18-year-old outfielder Heliot Ramos. Baseball's No. 63 overall prospect was outstanding in his debut season with a .348/.404/.645 slash line over 35 games in the Rookie-level Arizona League. The 19th overall pick in last year's Draft has the makings of a future star. There isn't much in the way of young depth behind him, though don't sleep on 2017 second-rounder Jacob Gonzalez. The son of former big league star Luis, the 19-year-old batted .349 in his pro debut at the complex level. Analysis: The A's have the fewest qualifying prospects among their top-30 prospect ranking. What they lack in quantity, however, they make up for in quality, led by No. 60 overall prospect Jesus Luzardo (20). The lefty packs an impressive three-pitch repertoire and posted a 1.66 ERA across three levels a season ago. With 18-year-old outfielder Lazaro Armenteros and 2017 sixth overall pick Austin Beck (19), the A's have two high-ceiling players who could take the same field with Class A Short Season Vermont or Class A Beloit this season. Analysis: The Red Sox boast one top-100 talent here in Jay Groome (19), though he's coming off an injury-riddled and inconsistent season across two levels. Boston added hard-throwing righty Tanner Houck (21) in the first round of the Draft. They also pushed 2016 international signee Bryan Mata (18) with an assignment to Class A Greenville, and he responded with a solid 3.74 ERA and 74 strikeouts in 77 innings with the South Atlantic League club. Analysis: Half of the Rangers' top 30 prospects meet this list's age requirement. No. 34 overall prospect Leody Taveras, a 19-year-old outfielder, is the club's lone top-100 representative, though. The speedster hit just .249 with Class A Hickory last season but also swiped 20 bases, cracked 35 extra-base hits and showed outstanding durability by appearing in 134 of 140 games. None of the players behind Taveras have quite the same ceiling, though 2017 second-rounder Hans Crouse rang up a dominant 0.45 ERA with 30 strikeouts during his pro debut in the Rookie-level Arizona League. Analysis: Jesus Sanchez (20) has slugged his way into the top 100 the last two seasons thanks to a tool set that grades above average across the board. Speedster Lucius Fox (20) stole 30 bases last year, while freshly signed Wander Franco (17) was the No. 2 prospect on the 2017-18 international market. Recent first-rounders Garrett Whitley and Joshua Lowe combined for 21 homers and 43 steals for Class A Bowling Green. Questions remain about their hit tools -- they combined for 266 strikeouts -- but at 20 years old, both have time to fix that. Analysis: The Pirates narrowly missed a chance to place higher on the list, due to the fact that star righty Mitch Keller turns 22 the day before Opening Day. There is still young potential to be had, though, beginning with 2017 first-rounder Shane Baz (18), their lone top-100 representative. Ke'Bryan Hayes (21) places outside the top 100 but showed across-the-board potential with Class A Advanced Bradenton last year. Speedy shortstop Cole Tucker (21) has flown through the system, reaching Double-A Altoona last season and will likely make his way to Triple-A Indianapolis at some point in 2018. Analysis: The Tigers are the first team to sport multiple top-100 representatives, with the impressive pitching trio of Franklin Perez (20), Matt Manning (20) and Beau Burrows (21). Acquired in the Justin Verlander trade last August, Perez posted a 3.02 ERA between Class A Advanced and Double-A in the Astros system last year and likely has the highest ceiling of the bunch. Don't overlook two of Detroit's other trade deadline acquisitions: Isaac Paredes (19) and Daz Cameron (21). The former smacked 11 homers with 70 RBIs at Class A last season, while the latter stole 32 bases at the same level and was a first-round pick in 2015. Analysis: The Indians make their way into the top half of these rankings on the arm of Triston McKenzie (20), easily the most talented player here. Opponents hit just .203 off him at Class A Advanced Lynchburg, and he used his advanced arsenal to rack up 186 punchouts in 143 frames. The talent drops off after him, though Bobby Bradley (21), Nolan Jones (19) and Willi Castro (20) all put up solid numbers in 2017. Analysis: Much like the Brewers system in general, the whole is greater than the sum of its parts. Keston Huira is a great piece to build around, and the ninth overall pick in last year's Draft batted .371 in 42 games between the Arizona League and Class A Wisconsin last year. Though Milwaukee lacks another top-100 youngster, it complements its top prospect with outstanding depth, including Trent Grisham (21), who racked up 37 thefts at Class A Advanced Carolina. Rigthy Freddy Peralta (21) is another interesting piece after he climbed to Double-A Biloxi and posted a 2.26 ERA in 63 2/3 innings there. Analysis: Similar to the Brewers, the Twins have a young star in 2017 first overall Royce Lewis (18), whom they complement with some older talent and a deep pool of youth. The Twins got aggressive with the shortstop last summer, allowing him to move to as high as Class A Cedar Rapids, and they may continue to push him quickly if he shows off impressive hit and run tools in his first full season. This group will get an even bigger boost if Alex Kiriloff (20) can return healthy and productive after missing all of last season following Tommy John surgery. Don't sleep on Wander Javier either, after the 19-year-old shortstop produced a .383 on-base percentage at Rookie-level Elizabethton in 2017. The Twins may have to find a way to pair Lewis and Javier at the lower levels, but they'll gladly take that problem. Analysis: Much of the hype for the Angels will be focused on Shohei Ohtani, but don't overlook the impressive group of young talent that has been quietly coalescing for a few years now. The team drafted 18-year-old outfielder Jo Adell with the 10th pick in the Draft, and he rewarded them with a .325/.376/.532 slash line in 49 games across both Rookie-level affiliates. Fellow top-100 prospect Jahmai Jones (20) continued to build his rapidly-rising stock with a .282 average and 27 steals between Class A Burlington and Class A Advanced Inland Empire. Signing shortstop Kevin Maitan (18) away from the Braves this winter gave Los Angeles another top-100 prospect to add to their group. Analysis: Few 21-year-olds had as impressive a season as Brendan Rodgers last year. Slow start at Double-A notwithstanding, the shortstop showed during his dominant run at Class A Advanced Lancaster that his offensive skill set is top-tier. Though questions exist about righty Riley Pint (20) after he struggled with Class A Asheville last season, Colorado has a number of youngsters pushing for top-100 consideration in third baseman Colton Welker (20) and righty Peter Lambert (20). Shortstop Ryan Vilade (19) hit .308 with Rookie-level Grand Junction in his pro debut. Analysis: Nick Senzel turned 22 last season, but 18-year-old righty Hunter Greene gives Reds fans a new young star to drool over. The second overall pick in the Draft can consistently hover around triple digits with his fastball and will get the chance to show a lot more this season after being limited to 4 1/3 innings in his debut. Up-and-coming outfielder Taylor Trammell (20) and righy Tony Santillan (20) dominated with Class A Dayton last season, and 2017 first-rounder Jeter Downs (19) has the potential to do the same this year after smacking six homers in 50 games with Rookie-level Billings last year. Analysis: There's a new top prospect in town for the Phillies: 19-year-old hurler Sixto Sanchez. The No. 26 overall prospect reached Class A Advanced Clearwater last year and, along with righty Adonis Medina (21) and southpaw JoJo Romero (21), gives Philadelphia an enviable trio of elite young pitchers. Outfielders Mickey Moniak (19) and Adam Haseley (21) were taken with the first and eighth overall picks, respectably, in the last two Drafts, and much will be expected of them going forward. Both finished last season with Class A Lakewood. Analysis: Somehow still just 21, Alex Verdugo banged down the door to the big leagues last year after hitting .314 in 117 games with Triple-A Oklahoma City. In Keibert Ruiz (19), the Dodgers also have the top under-21 catching prospect in the game. The six-foot, 200-pounder has already reached Class A Advanced Rancho Cucamonga, and scouts rave about his exceptional bat and advanced receiving skills behind the plate. Los Angeles lacks a stud young pitcher, but it's hard to argue with the system's positional depth when it comes to young bats. Analysis: Victor Robles (20) is a star in the making who has already reached the big leagues, while Juan Soto (19) is not far behind in terms of potential. The latter was limited to 23 games at Class A Hagerstown after nine in the Rookie-level Gulf Coast League, but boasts an outstanding hit tool as well as impressive speed and power. Shortstop Carter Kieboom (20) was having a breakout season with Class A Hagerstown last year before going down with a hamstring injury in May. Like the Dodgers, the Nationals don't boast a top-100 under-21 arm, though lefty Seth Romero (21) just makes the age cutoff and could push for consideration if he's able to avoid any further off-the-field issues. Analysis: Assuming infielder Gleyber Torres (21) bounces back with a healthy season, the Yankees boast an outstanding young trio down the middle, along with outfielder Estevan Florial (20) and lefty Justus Sheffield (21). Torres and Sheffield, in particular, are already closing in on the big leagues after finishing last season at Triple-A Scranton/Wilkes-Barre and Double-A Trenton, respectively. Keep an eye on 18-year-old righty Luis Medina. Signed out of the Dominican Republic in 2015 and capable of hitting triple digits with ease, the hurler has been limited to just 23 innings stateside so far. He'll have a greater chance to shine this season. Analysis: Much of this ranking can be attributed to the meteoric rise of the tandem of Vladimir Guerrero Jr. (18) and Bo Bichette (20). Few systems boast a more explosive young duo after they tore up the Class A Midwest League with Lansing last season, with Bichette hitting .384 and Guerrero .316 before both moved up to Class A Advanced Dunedin in July. The depth behind them isn't as strong as the next four systems, though righty Nate Pearson (21) can bring some serious heat and allowed just two runs in 19 innings in his pro debut with Class A Short Season Vancouver. Analysis: Each of the Astros' top six prospects are under 21, with half of those players in MLB.com's top 100. In hurler Forrest Whitley (20) and outfielder Kyle Tucker (21), Houston has potential foundational pieces that could contribute for years to come. Though Whitley will miss the first 50 games of 2018 due to suspension, the righty fanned 143 batters in 92 1/3 frames last year and looks to have the makings of a future ace. Tucker could anchor the outfield of the future in Houston, thanks to his rare combination of power, speed and average that led to a 25-homer, 21-steal season with Class A Advanced Buis Creek and Double-A Corpus Christi. Righty J.B. Bukauskas (21) and outfielder Yordan Alvarez (20) provide quality depth behind the two stars. Analysis: Boasting the the highest-ranked combination of pitcher and hitter in the league, the White Sox possess MLB.com's second-ranked outfielder in Eloy Jimenez (21) and third-ranked righty in Michael Kopech (21). Between Jimenez, Luis Robert (20) and Blake Rutherford (20), Chicago could field an entire outfield of top 100 prospects under 21 years old. Jimenez is the star of the group after hitting .312 with 19 homers and reaching Double-A Birmingham in 2017, while Kopech and his plus-plus fastball made their way to Triple-A by season's end. That's not even getting to intriguing depth pieces such as Luis Alexander Basabe (21), who sports plus speed and stole 17 bases with Class A Advanced Winston-Salem. 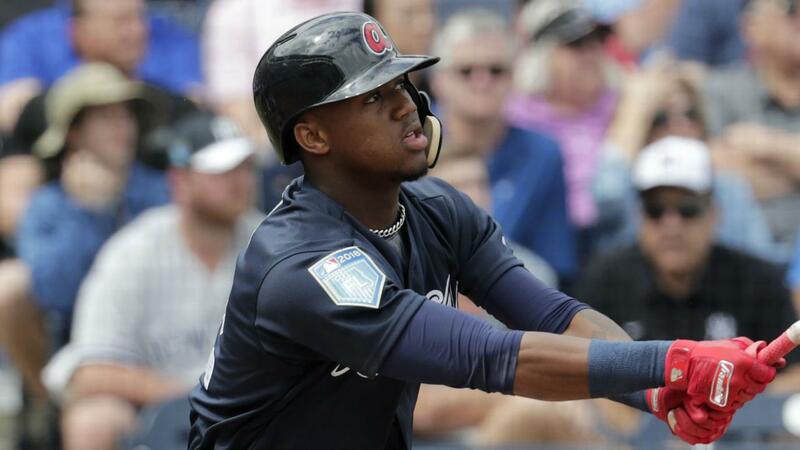 Analysis: The Padres system is built on an enviable core of youth. Fernando Tatis Jr. (19) and Luis Urias (20) have built their stocks considerably the past two seasons and soared through the system to Double-A and Triple-A, respectively, last season. Lefty MacKenzie Gore (19) adds another uber-talented youngster after the Padres took him with the third pick in the 2017 Draft. That trio is hardly alone; look no further than Class A Fort Wayne, which rode a wave of talented teens to the Midwest League championship series. Gabriel Arias (18), Adrian Morejon (18), Anderson Espinoza (20) and Logan Allen (20) all appeared on that team this season, while 2016 first-round pick Hudson Potts combined with Tatis to become the first 18-year-old players to hit 20 or more homers in the Midwest League since 1987. Analysis: Of the Braves' top 30 prospects, 19 are under-21 with a whopping six of those players residing in MLB.com's top 100. Atlanta boasts the No. 1 outfield prospect in the game in Ronald Acuna Jr. (20), whose coming-out party in 2017 saw him shoot through the system all the way to Triple-A Gwinnett while producing a .325 average, 21 homers, 31 doubles, 82 RBIs and 44 stolen bases. However, the system truly shines when it comes to young pitching. Precocious hurlers Mike Soroka (20), Kolby Allard (20) and Luiz Gohara (21) all made it to Double-A or beyond last year, Combined with a host of high-ceiling teens such as 2016 first-round pick Ian Anderson (19), Atlanta's rotation could be set for years to come.